Secure Wealth Management’s investment approach combines asset selection, based on fundamental and technical criteria, with quantitative risk management. 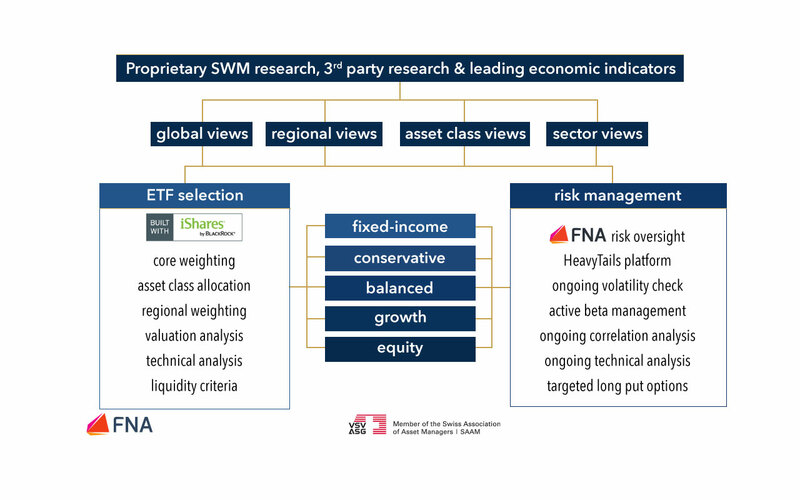 SWM works with BlackRock, the world’s largest asset manager, in our ETF portfolio construction. We make extensive use of their ETF Model Portfolio research in our ETF selection and risk management processes. We follow a blend of fundamental and technical approaches, broadly in a 30:70 relationship. No investment decision will be executed unless the technicals suggest the timing is correct. We have a core / satellite structure, where each component is actively managed. For example, we can adopt a cyclical or defensive tilt within the core. The satellite positions make up around 60% of each portfolio. We do not have any constraints on the level of cash we can hold, and are not tied to any particular index or benchmark. We employ cutting-edge network analysis techniques supplied by Financial Network Analytics, our strategic partner for risk management. Using FNA’s HeavyTails software, we examine a broad range of statistical indicators for our ETF universe on a daily basis. These highlight entry- and exit-points for our ETF portfolios. 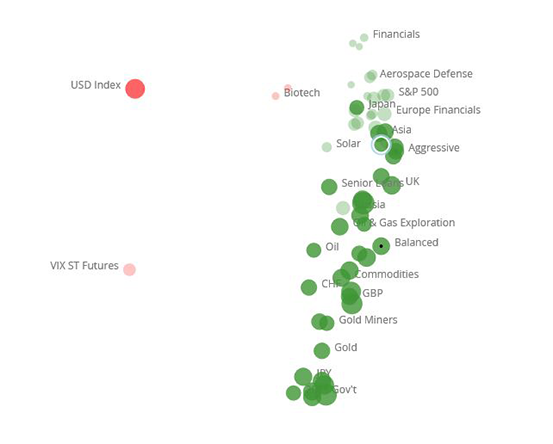 HeavyTails provides key signals relating to systemic risk and how this affects each of our ETF positions. For every potential new ETF that we take into our portfolios, we will closely examine the correlation with the other positions and the impact on overall portfolio volatility, beta and Sharpe ratio. For all ETFs held in our portfolios we carry out ongoing correlation and volatility analysis to highlight changes in the time series of these variables. A detailed presentation of our complete investment approach and risk management processes is available for our partner firms and their clients. Please contact us for more details. HOW DO WE CHOOSE THE ETFs IN OUR PORTFOLIOS? We only use replication ETFs, which are a simple and elegant instrument. We do not use any synthetic, leveraged or inverse ETFs. at Secure Wealth Management, most of the ETFs we employ in our portfolios have market capitalisations in the USD billions, making them some of the most liquid investments available anywhere. We only use ETFs that have a market capitalisation of at least USD 100 million, and daily US dollar liquidity of at least 20 million. we actively monitor the costs of all the ETFs in our investment universe (numbering over 450 ETFs currently). All else being equal, we will always choose the lowest-cost ETF, considering the TER (Total Expense Ratio) and bid-offer spread.